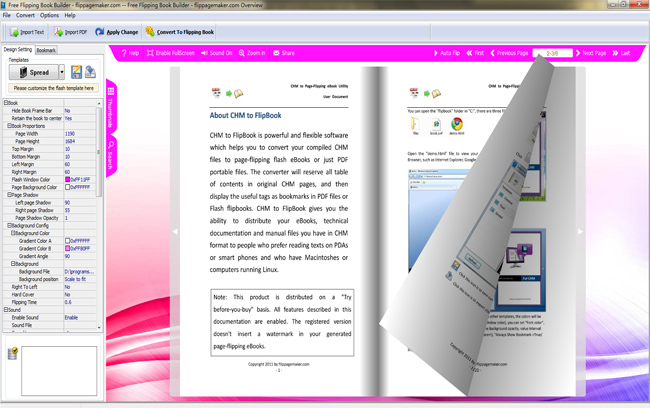 Just as its name suggests, Free Flipping Book Builder is a piece of freeware that can help to build page flipping book. With this flash book builder, you can easily convert Text file into flash flip book. And you can define different settings based on the built-in templates. The interactive page turning effect of the output publication will give you an experience of flipping real paper book. Free Flipping Book Builder is more than a simple flip book maker for Text. This freeware also provides a series of useful settings for you to stand out your output flipbook. By inserting certain background image and music; adding specific company logo; using different colors for the flash, bars, icons, and so on, you are going to publish an outstanding and unique flip book. By converting Text file to page flipping book, you will animate the Text. Your readers can feel the page turn animation. And in the meanwhile, you can set page thickness and shadow effect for the flip book. Besides, this flash book builder also enables you to make hard cover for the book to make it more realistic, just like a physical book. You can output the book in HTML, ZIP, EXE or even burn it to CD. CD is able to run on computer.What's more, this flash book builder supports share function. Enable "Share" and upload the exported book online, you and your can share the flip book via social networks such as Facebook, Twitter. Flippagemaker Free Page Flip Maker (Popularity: ) : Make professional page flip promotion brochures! Flipping Book (Popularity: ) : A Flash component intended for page flipping. Supports Flash MX and Flash MX 2004 authoring tools. The component supports pages containing library symbols, external JPEG images and external SWF files. Also, flipping sound is supported. Jody Salt's professional guest book script (Popularity: ) : This script has all the powerful features of Jody's free guest book, but without the branding at the bottom of each page.